The State Of Texas’ Renewable Energy Policy: Good Grief! Earlier this week I posted a few of the great clean energy stories throughout Texas, with a glancing reference to the exciting work going on in San Antonio. Almost as soon as the post went up San Antonio’s electric utility CPS Energy (CPS) made an announcement that is truly astounding: because of the increasingly lower costs of solar power and rising costs of fossil fuels, they have increased their bid for a solar power plant from 50 MW to 400 MW. I’ll let that sink in a little, but I’ll just say this: they mean it. It’s been fascinating to watch this historical shift over the last several years at CPS (the largest utility of its kind in the nation) from a conventional utility with conventional power plants to a national leader in wind and solar. It’s a story that is probably worth several blog posts in its own right, and unfortunately we don’t have the space to go into it today. While cities like Houston, Austin & San Antonio are leading the way on clean energy, the state of Texas is still falling behind. When the state legislature wrapped up their session with little help to offer the solar industry and other forms of renewable energy, there were few opportunities left for a stable regulatory framework for renewable energy in Texas. The best hope was for the Public Utilities Commission (PUC) to enact the goal for non-wind renewable energy in the state set by the Texas Legislature in 2005, which expires today with the deadline to consider the rule proposed in January. It’s no surprise that the wheels of commerce turn faster than the gears of government, but it’s taken seven years for the PUC to come close to finally enacting this goal and it looks like they’re going to drop the ball again. 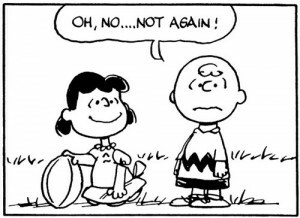 When it comes to clean energy in Texas, it reminds me of Lucy and the football from Charlie Brown: every time the state gets close to creating a market for solar power, they yank the football away again. The PUC proposed this rule back in January and has apparently decided to back out of it. Senator Troy Fraser, historically a champion of solar power filed his bill that came very close to passing last session but failed to bring it up for a hearing this session despite being Chair of the Committee the bill sat in. Governor Perry has championed Texas’ leadership in wind energy as proof that Texas can create good clean energy policy, but sent mixed signals this session, leaving open the question of whether or not he supports solar power or other renewables as he does wind. Will Texas Be The Clean Energy Capitol? Businesses can’t operate under that kind of uncertainty, and the solar industry is the fastest growing industry in the U.S. A handful of Texas cities, like San Antonio, Houston and Austin, are working hard to capitalize on that growth by creating new jobs locally, but without a stable statewide policy, businesses won’t come to or stay in Texas. Just last week, the U.S. Department of Energy announced $4.5 billion in loan guarantees for solar projects. Unfortunately, none of the projects are in Texas, though, because the business climate is too uncertain in our state to get solar projects of the scope and scale needed to attract that kind of business. This entry was posted in Renewable Energy, Texas. Bookmark the permalink. Both comments and trackbacks are currently closed.